All (sub-)Antarctic highlights in one voyage, with spectacular landing sites on the Falkland Islands and encounters with black-browed albatrosses and rockhopper pinguins. This voyage includes also four days on South Georgia, probably the most beautiful place on earth. Be prepared for ten thousands of king penguins and their chicks, sea lions on the beaches, elephant seals, wandering albatrosses and Gentoo penguins and great historical sites including the trails of British Polar explorer Ernest Shackleton. 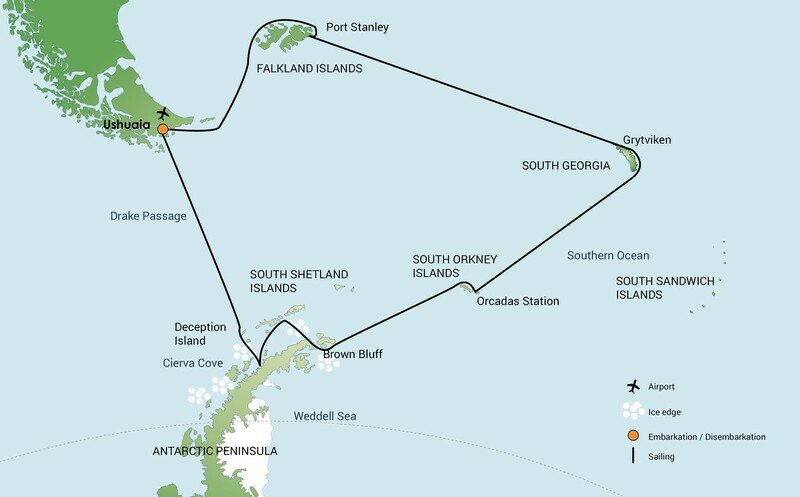 We plan a visit to Orcadas station on South Orkney Islands and If the ice permits we will sail into the Weddell Sea through the ice-clogged Antarctic Sound. Huge tabular icebergs will announce our arrival to the eastern side of the Antarctic Peninsula. Please note: 9 Nov - 29 Nov, 2017 & 3 Nov - 23 Nov, 2018 departures are 21 days long. 22 Dec, 2018 - 9 Jan, 2019 departure is 19 days long. In the afternoon, we embark in Ushuaia, Tierra del Fuego, Argentina, the southernmost city in the world located in the shadow of the Andes and right at the Beagle Channel shore. We’ll sail through this scenic waterway for the rest of the evening. In the Falkland Islands (Malvinas) we plan to spend the whole day on the fascinating western side of the archipelago. A hike along the shore of Carcass Island will give us views of Magellanic and Gentoo-Penguins, as well as close encounters with water fowl and Night herons and passarines. In addition, on Saunders we will be able to observe four species of breeding penguins (Gentoo, King, Magellanic and Rockhopper), Black-browed Albatrosses and King Cormorants. On our way to South Georgia we will cross the Antarctic Convergence. Entering Antarctic waters, the temperature will drop by as much as 10 degrees C in the time span of only a few hours. Near the Convergence we will see a multitude of southern seabirds near the ship; several species of Albatrosses, Shearwaters, Petrels, Prions and Skuas. In the afternoon of day 7 we arrive at our first landing site in South Georgia. We might visit the bay of Elsehul, with its very active fur seal breeding beach, and then set course to Right Whale Bay, Salisbury Plain, Godthul, St. Andrews Bay, Gold Harbour, Cooper Bay and Drygalski Fjord to give you a good opportunity to see a wide spectrum of landscapes and wildlife, like the introduced Reindeer, Elephant seals, Fur seals, King and Macaroni Penguins. One of the highlights might be our visit to Prion Island, where we will witness the breeding efforts of the huge Wandering Albatross and enjoy watching their displays. At Fortuna Bay, we might try to follow in the footsteps of the great British Explorer Ernest Shackleton and hike over to Stømness Bay. There and at Grytviken we’ll see an abandoned whaling village, where King Penguins now walk in the streets and seals have taken over the buildings. At Grytviken we’ll also offer a visit to the Whaling History Museum as well as to Shackleton´s grave near by. We will depart from South Georgia in the afternoon of day 10. Where the ship is again followed by a multitude of seabirds. At some point we might encounter sea-ice, and it is at the ice-edge where we might have a chance to see some high-Antarctic species like the McCormick Skua and Snow Petrel. If the ice permits we will sail into the Weddell Sea through the ice-clogged Antarctic Sound. Huge tabular icebergs will announce our arrival to the eastern side of the Antarctic Peninsula. We plan to visit Paulet Island with a huge number of Adélie penguins and Brown Bluff where we may set foot on the Continent. In good sailing conditions we may decide to extend our time in the Weddell Sea. The volcanic islands of the South Shetlands are windswept and often shrouded in mist, but do offer subtle pleasures. There is a nice variety of flora (mosses, lichens and flowering grasses) and fauna, such as Gentoo Penguins, Chinstrap Penguins and Southern Giant Petrels. On Half Moon Island we will find Chinstrap Penguins and Weddell Seals often haul out on the beach near the Argentinean station Camara. In Deception Island our ship braves into the entrance of the crater through the spectacular Neptune’s Bellows. Deception itself is a sub-ducted crater which opens into the sea creating a natural harbour for the ship. Here we find hot springs, an abandoned whaling station, thousands of Cape Petrels and many Kelp Gulls, Brown and South Polar Skuas and Antarctic Terns. Wilson’s Storm Petrels and Black-bellied Storm Petrels nest in the ruins of the whaling station in Whalers Bay. A typical itinerary to the Falklands, South Georgia and the Antarctic Peninsula is illustrated above. This itinerary is for guidance only. Programs may vary depending on local ice and weather conditions, the availability of landing sites and opportunities to see wildlife. The final itinerary will be determined by the Expedition Leader on board. Flexibility is paramount for expedition cruises. M/V "Plancius" was built in 1976 as an oceanographic research vessel for the Royal Dutch Navy and was named "Hr. Ms. Tydeman". The ship sailed for the Dutch Navy until June 2004 when she was converted into an expedition cruise ship.. The vessel was completely rebuilt as a 114-passenger vessel in 2009 and complies with the latest SOLAS-regulations (Safety Of Life At Sea). M/v "Plancius" is classed by Lloyd's Register in London and flies the Dutch flag. M/v "Plancius" accommodates 114 passengers in 53 passenger cabins with private toilet and shower in 4 quadruple private cabins, 39 twin private cabins (ca. 15 square meters) and 10 twin superior cabins (ca. 21 square meters). All cabins offer lower berths (either two single beds or one queen-size bed), except for the 4 quadruple cabins (for 4 persons in 2x upper and lower beds). The vessel offers a restaurant/lecture room on deck 3 and a spacious observation lounge (with bar) on deck 5 with large windows, offering full panorama view. M/v "Plancius" has large open deck spaces (with full walk-around possibilities on deck 3), giving excellent opportunities to enjoy the scenery and wildlife. She is furthermore equipped with 10 Mark V zodiacs, including 40 HP 4-stroke outboard engines and 2 gangways on the starboard side, guaranteeing a swift zodiac operation. M/v "Plancius" is comfortable and nicely decorated, but is not a luxury vessel. Our voyages in the Arctic and Antarctic regions are and will still be primarily defined by an exploratory educational travel programme, spending as much time ashore as possible. This vessel will fully meet our demands to achieve this. The vessel is equipped with a diesel-electric propulsion system which reduces the noise and vibration of the engines considerably. The 3 diesel engines generate 1.230 horse-power each, giving the vessel a speed of 10 - 12 knots. The vessel is ice-strengthened and was specially built for oceanographic voyages. M/v "Plancius" is manned by 17 nautical crew, 19 hotel staff (6 chefs, 1 hotel manager, 1 steward-barman and 11 stewards / cabin cleaners), 8 expedition staff (1 expedition leader and 7 guides-lecturers) and 1 doctor. Ice class: Plancius was built for Ice conditions. To reach these ice-conditions she has a strengthened bow and stern. The hull is thicker and the whole construction on the waterline of the vessel is reinforced by using extra frames. Where the normal frame spacing is 65cm, we have on the bow-line and stern also frames in between so there the frame spacing is approx 30cm. Because Plancius was built to do surveys she has a special six blade bronze propeller, the shape of the propeller makes Plancius a very silent ship. Plancius has a Lloyds class notation 100A1 Passenger ship, Ice Class 1D at a draught of 5 meters (which is our waterline). Sailing along the pack-ice of North Spitsbergen, will give us the best opportunities to spot the King of the Arctic. We sail to Raudfjord on the north coast of West ......click here to read more. Start your North Spitsbergen cruise with a trek around historic Longyearben, then join our expedition to the north of the island to take in the fantastically beautiful landscapes, the thousands ......click here to read more. The Spitsbergen and Northeast Greenland cruise sails waters filled with breath-taking scenery. The expedition passes through areas that are home to seals, seabirds, whales, and polar bears, topped off with ......click here to read more.